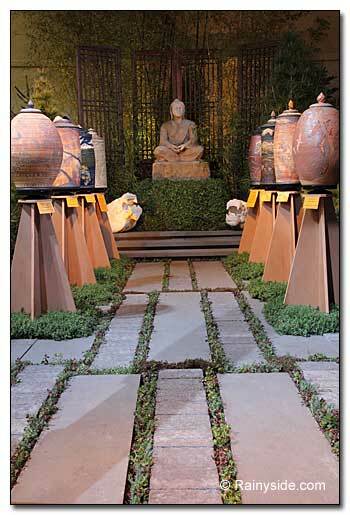 Every time I see one of Iftikhar Ahmed’s designs, I see a garden inspired by tranquility. 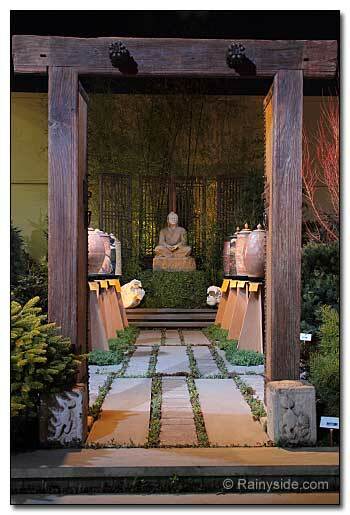 This meditation garden is the best of his displays that I’ve seen so far! 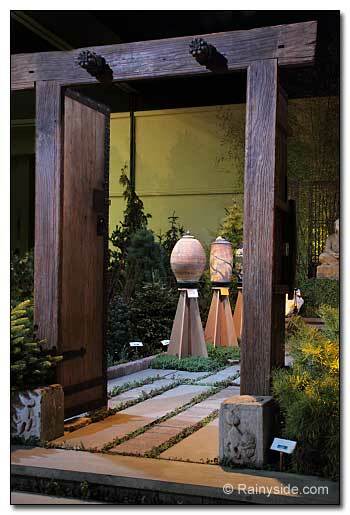 He set the stage with an antique temple gate at the entrance. 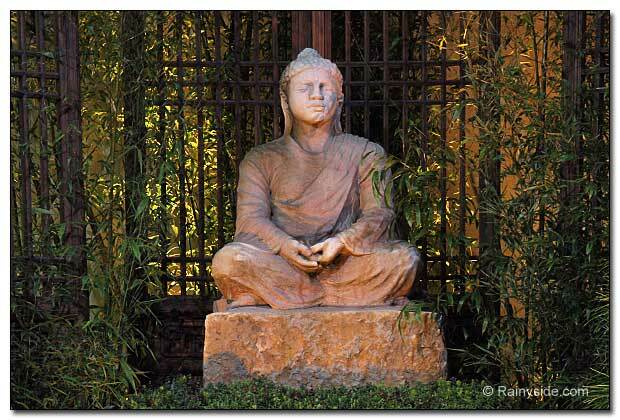 When I looked down through the entrance to the Buddha beyond, I found myself drawn to the peace of this space. Even though the display gardens are not that large, his design of laying long rectangular pavers, flanked on either side by a row of prayer wheel sculptures, tricked my eye into believing the space was longer than it really was. Ahmed filled the gardens with many Northwest plant species and placed art as accents throughout. 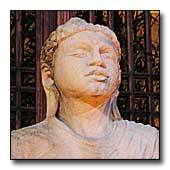 Two dragonheads were placed on either side of the Buddha sculpture and an airy planting of bamboo mixed with the screen in the background. A Tibetan Buddhist tradition for over a thousand years, the prayer wheel, also known as a Mani wheel, brought a fantastic element to the garden. The stoneware and porcelain prayer wheels accumulate wisdom and merit and also purify the negative when visitors touch them, turning the wheels. I noticed that everyone who went into the garden placed hands on the beautifully carved and painted wheels. Art should evoke memories or emotions in each beholder. It touches everyone in different ways. 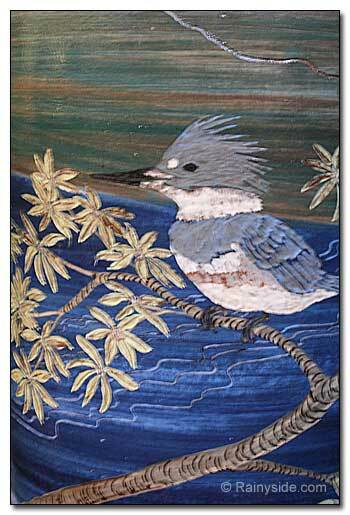 My favorite cylinder held the image of a kingfisher. It reminded me of the bird I often spotted on a power line above a cove I pass on my way into town. The lines were taken down when a bridge was put in to restore the inland part of the cove that was silting up. The covert pipe under the road impeded the tidal action that filled and emptied the estuary backwaters several times a day. During the restoration when they constructed the bridge, I didn’t see the bird. A few months after the bridge was complete I spotted a kingfisher perched on the rail of the new bridge. Now, I could see the little bird, with the big head, closer than when he perched on the power lines above. 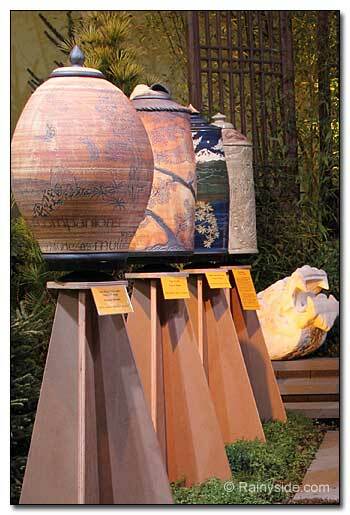 When I went into Ahmed’s garden at the Northwest Flower and Garden Show, I put my hands on this cylinder and turned it, and smiled over the memory evoked in this beautiful garden.